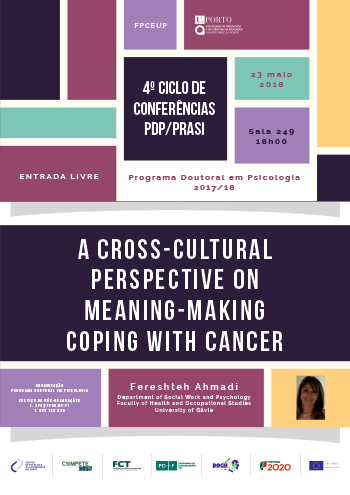 O 4º ciclo de conferências do Programa Doutoral em Psicologia (2017/18), recebe Fereshteh Ahmadi, do Department of Social Work and Psychology,Faculty of Health and Occupational Studies, University of Gävle (Suécia), para uma conferência intitulada "A cross-cultural perspective on meaning-making coping with cancer". A conferência acontece no dia 23 de maio de 2018, às 18h00, na sala 249 da FPCEUP. Fereshteh Ahmadi is Full Professor of Sociology at the Faculty of Health and Occupational Studies, Department of Social Work and Psychology, University of Gävle (Sweden). Ahmadi concluded her Ph.D in Sociology at Uppsala University in 1995. Ahmadi is presently specializing in issues related to health, religion and spirituality. In addition, she has conducted research on gerontology, international migration, Islamic Feminism and Music and Coping at Uppsala University. She is responsible for a research on Diversity Barometer. She is also responsible for an international project on Meaning-Making Coping facing cancer. The project involves researchers from Sweden, South Korea, China, Japan, Malaysia, Philippines, Brazil, Turkey, Iran, and Portugal.